Preethi Eco Plus Mixer Grinder.. Product weight is 0.1175 lbs. The Preethi ECO PLUS MG-138 Mixer Grinder features 550 Watt motor. The mixer comes with 100% stainless steel jars with flow breakers for fine grinding. The steel blades of the mixer grinder are machine ground and polished for maximum grinding efficiency. It has high grade Nylon Couplers for smooth and hassle free operation. The clear and transparent polycarbonate domes & lids add to the quality factor. The sturdy handles are ergonomically designed. Comes with 3 (1.5 Liter, 1.0 Liter and 0.4 Liter) Stainless steel Jars for Wet and Dry grinding, whipping, churning Grating, Mincing, and Chopping Please user manual under the product details for setup and usage related guidance. The Preethi ECO PLUS MG-138 Mixer Grinder features 550 Watt motor. The mixer comes with 100% stainless steel jars with flow breakers for fine grinding. The steel blades of the mixer grinder are machine ground and polished for maximum grinding efficiency. The Preethi ECO PLUS MG-138 Mixer Grinder is rich in quality as well. It has high grade Nylon Couplers for smooth and hassle free operation. The clear and transparent polycarbonate domes & lids add to the quality factor. The sturdy handles are ergonomically designed. Once you buy the Preethi Mixer Grinder, you can be sure of its reliability. It comes with the assurance of lifelong free service. The bush life is extended by the oil-filled Sintered Bronze bushes. The mixer grinder is high on safety also. The mixer comprises of cut-off for protection against voltage fluctuation and overload. It has totally shock proof ABS Body and PVC insulated 3 core and flexi cord with 10 amps plug top & earthling. The top of the grinder can be seen as a little yellow. The top is greased/oiled on purpose to avoid friction. It's meant to be greased/oiled, without it, the product will heat up very quickly. I never been into putting the reviews on the websites. 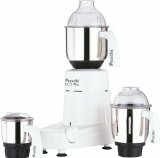 This is the first time I went through the frustrating moment when we received the "Preethi Eco Mixer" from General Elect through Amazon.com, As per the review published by an another customer who reported that "General Elect" is selling this used Mixer ......."UNBELIEVABLE !!!! ", I have seen it myself and shocked. I am sure this used Mixer is going from one customer to another. They should see..
After 8 months to date, Great Elect has sent me an email stating that they will offer me a free mixer if I remove this review. Their email quote "We would like all of our customers that have received mixers in bad condition to reconsider there thoughts on Preethi." which basically means there are bunch of other customers they have shipped this used mixer and now offering free mixer to get the reviews removed.I responded back to them that I dont ca..